Technical Specs from StarTech Website;. Bought for a job but never needed and used in the end. Grab a bargain. Maximum Mounting Depth 152.4 mm [6 in]. Minimum Mounting Depth 76.2 mm [3 in]. LINK TO MANUFACTURERS WEBSITE;. Mounting options: Front mount (front only). Colour: Black. Colour Black. Work & Protective Clothing. Tool Storage. Tool Accessories. Product Information. Manufacturer's part no.CABSHELFV. 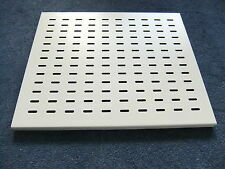 It has perforations in the base of the tray to better ventilate the devices of the cabinet. It adds lateral bearings that allow to slide the tray to extract it towards the outside of the closet and thus be able to manipulate better the devices that are on her. A shelf bought for my cabinet but never got around to using them as well as the x2 brackets. Brackets are 420mm. The warranty covers manufacturer faults and does not cover misuse of the item, for example a 'blown out' speaker. When will I receive confirmation of my order?. Can I reserve item(s) that I intend to buy later?. Server cabinets 32U. In the last few years prices of server racks have been high, but Rack Supplier has succeeded in reducing their prices while maintaining very high quality. Server racks. 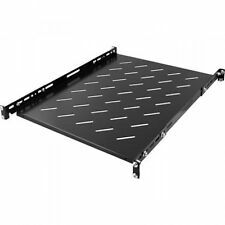 Rack Supplier Ltd.
Eagle Vented Cantilever Server Cabinet Shelf (Size 2U Size (mm) 381) Eagle Server Cabinet Shelf, suitable for use in the Eagle range of Cabinets. The shelf is rated up to 60 kg and vented to allow vertical airflow. Eagle Vented Cantilever Server Cabinet Shelf (Size 1U Size (mm) 600) Eagle Server Cabinet Shelf, suitable for use in the Eagle range of Cabinets. The shelf is rated up to 60 kg and vented to allow vertical airflow. Compatible with all 19in (wide) server racks/cabinets, the fixed rack shelf can be adjusted from 19in to 38in (depth) as necessary. For use with all 19 wide Server Racks and Cabinets. Product Type Network Rack Chassis. Eagle Vented Cantilever Server Cabinet Shelf (Size 1U Size (mm) 800) Eagle Server Cabinet Shelf, suitable for use in the Eagle range of Cabinets. The shelf is rated up to 60 kg and vented to allow vertical airflow. Manufacturer Code: CABSHELF22V. Rack Height: 2U. 1 - 2U 22in Depth Rack Shelf. Universal 19" rack design makes it simple to add a storage shelf to almost any rack or cabinet. Fits all standard 19" server racks. Manufacturer Part Number: 712521. Product Model: 712521. Choose from four versions, suitable for every need: fixed, cantilever, heavy-duty (up to 100 kg) or sliding. Beyond that, you have flexibility with depths that range from 150 mm to 900 mm and a choice of black (RAL9005) or gray (RAL7035). Server cabinets 18U. In the last few years prices of server racks have been high, but Rack Supplier has succeeded in reducing their prices while maintaining very high quality. Cabinet accessories. 10" wall cabinet. What if I have not received my order?. Can I reserve item(s) that I intend to buy later?. San Marino. Czech Republic. Speaker Hardware. Size (mm): 381. 1.5mm Black powder coated sand finish texture. Up to 60KG load. Part Number – 40K6422 40K6417. 1 x IBM Bladecenter Shelf Server Rack Rail Kit. 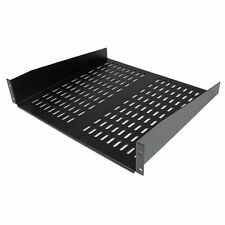 1 x Apple XServe G4 G5 Server Cabinet Rack Shelf.